The Birther movement received its biggest backer in March when Donald Trump jumped on the bandwagon. Trump was relentless in his fight, even proudly displaying his own official birth certificate on national television and heading to Hawaii to conduct a personal investigation. In late April, after nearly six weeks of Trump's heckling, the White House released Obama's long-form birth certificate, effectively halting the rumor mill. "We do not have time for this kind of silliness," Obama explained, noting that this issue had become too much of a distraction. Donald Trump, feeling victorious, took a lion's share of the credit. "I am very proud of myself because I have accomplished something that nobody else has been able to accomplish," he said. 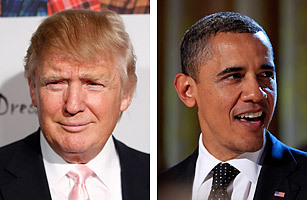 Obama agreed: "No one is prouder to put this birth certificate to rest than The Donald. Now he can get to focusing on the issues that matter. Like, did we fake the moon landing? What really happened at Roswell? And where are Biggie and Tupac?"